A HERO COMES ALONG...Oriel Boys High goalkeeper Panashe Nyabungu is carried shoulder high after his heroics, in saving penalties in the shootout, helped his school power to victory over Mabvuku in the Copa Coca-Cola Under-16 boys Harare provincial final yesterday. 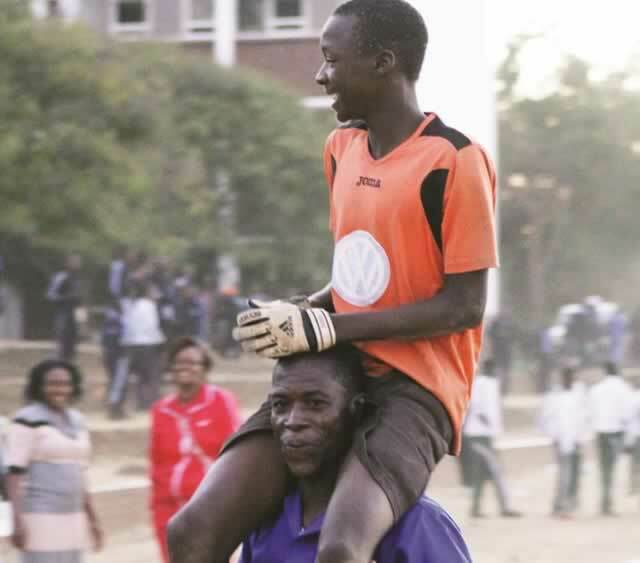 A HERO COMES ALONG…Oriel Boys High goalkeeper Panashe Nyabungu is carried shoulder high after his heroics, in saving penalties in the shootout, helped his school power to victory over Mabvuku in the Copa Coca-Cola Under-16 boys Harare provincial final yesterday. THE spotlight fell on the best Under-16 footballers in schools yesterday as the Copa Coca-Cola provincial finals roared off across the country. With the nation still counting the costs of the failed 2015 Nations Cup campaign, which means the Warriors will be out of international football for, at least two years, there have been calls for a focus to be turned on the emerging players. Sport, Arts and Culture Minister Andrew Langa said it was important for the country to return to the basics and revisit its youth development structures for domestic football to achieve success in the long-term. Zifa have also conceded, in an address made by its president Cuthbert Dube at the football indaba, that it was important to devote energy and resources on developing the country’s teenage footballers. Yesterday hundreds of some of the finest Under-16 footballers in the country paraded their skills, at different venues, as the battle for the Copa Coca-Cola football title reached the provincial finals’ level. Oriel Boys High emerged winners of the boys’ Under-16 Copa Coca-Cola tournament Harare provincial finals when they beat Mabvuku 1 High School 3-1 on penalties to book their place in the national finals to be held next month. Wilson Mutekede, the coach of Northern Region Division One side Twalumba, was one of the scouts at Oriel. Twalumba have built their team largely on schoolboys this year. Pamushana, who have produced a number of players who went on to make a mark in the Premiership in recent years, also won their provincial finals in Masvingo. In Harare, the big match ended 0-0 in regulation time and had to be decided by spot kicks. Oriel emerged the winners with their goalkeeper, Panashe Nyabungu, rising to the occasion as he saved Anesu Nyamasoka and McDonald Chimchembele’s efforts. Tinashe Diiza also missed his spot kick while Oriel converted all the spot kicks they took. Nyabungu also converted a penalty helping his side progress to the national tournament. Their other two penalties were converted by Leslie Kashitugu and Ali Sorija. This is the first time Oriel will be competing in the national finals and team coach, Shadreck Machihani, was a happy man after yesterday’s victory. “Using the correct age-group and proper team took us through this tournament because comparing our team with others, it shows they did not prepare properly. We are continuing to work hard towards the national finals. This is our first time to win since I came here and it shows that there is growth. “At least, we have a future, last year we lost in the districts with the same boys so the team has a bright future,” said Machihani. The provincial winners beat Churchill 1-0 in the semi-finals. However, both schools will take part in the boys’ competition as Churchill have already qualified by virtue of being the hosts for this year’s boys national finals. In the girls’ Under-17 tournament, former champions Vainona progressed to the national finals after beating Mbare High 4-0.They got their goals from Fungai Bvekwa, who scored a brace, and Greater Bhande weighed in with a goal. The other goal was an own goal by a Mbare defender. Vainona have been participating in the tournament since the inception of the girls’ competition in 2011 when they won the title. They went on to lift the title again in 2012 before losing to Chidyamakono of Masvingo in last year’s finals. Vainona coach Langton Kagwere was satisfied with his team’s performance but noted that they need to improve if they are to impress in the finals. “My major concern was complacency which they managed to overcome. Generally, the performance was okay. But we need to improve because when we go to the national finals the competition will be high. “We need to up our game for the nationals. Our major area of concern is scoring, we take things for granted thinking we will eventually score,” said Kagwere. Vainona join this year’s girls tournament hosts, Roosevelt, in representing Harare in the national finals from July 18 to 20. Midlands finals will be played on July 4 at Guinea Fowl and Mashonaland Central girls competition is slated for July 11 at Nagle House. Chemhanza of Mashonaland East are the defending champions in the boys section while Chidyamakono are the title holders in the girls category. Boys: Bulawayo (Mzilikazi), Manicaland (Mutare Boys High), Mashonaland Central (Chipadze), Mashonaland West (Vimbai), Masvingo (Pamushana), Mashonaland East (Mukondwa), Matabeleland North (Chinonge), Matabeleland South (Mzingwane). Girls: Bulawayo (Magwegwe), Manicaland (Nyamaruru), Mashonaland Central(St Francis), Mashonaland West (Sodbury), Masvingo (Chidzikwe), Matabeleland South (Muzimuni), Matabeleland North (Chilisa).